eD@HoMe: My first cover from Trinidad & Tobago! My first cover from Trinidad & Tobago! 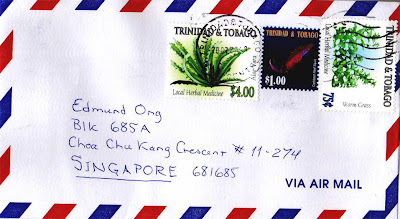 Yesterday, I was extremely delighted to receive an unexpected cover from Trinidad & Tobago! It is my first cover from this beautiful archipelagic state in the southern Caribbean and it really made my day! Thank you so much, Matthew Cassetta for helping me to work towards my goal of getting at least a mail from every country! 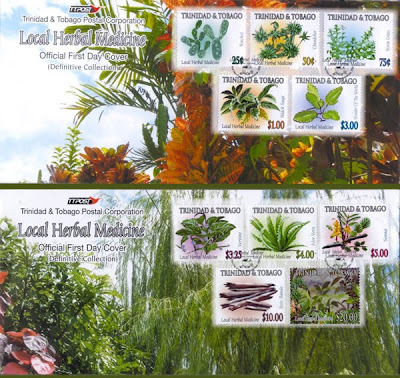 The left and right stamps franked on this awesome cover belong to "Local Herbal Medicine" series, issued on 18th May 2005. The stamps in this series depict many of the native herbal plants such as Chandelier, Worm Grass, Black Sage, Vervine and Aloe Vera. The blue coloured stamp used on this cover is from the "Coastal Dreamscape" series, issued on 1st May 2005. This beautiful set features ten $1 denomination stamps showing Rough File Clam, Caribbean Reef Squid, Peppermint Shrimp, Hawksbill Turtle, Queen Angel Fish, Southern Sting Ray, Giant Anemone, Christmas Tree Worm, White Speckled Hermit Crab and Four Eye Butterfly Fish. This cover was postmarked on 20th July 2009 in Trinidad & Tabago and took 19 days to travel an estimated distance of 17, 920kms to reach me! My first cover from Spain! My first cover from Pakistan! An awesome french aviation cover! A lovely butterfly cover from Turkey! An awesome cover from Brazil! A beautiful postcard from Estonia! A great cover from USA! An awesome FDC from Poland! An awesome cover from France! A lovely cover from Vietnam! An awesome cover from Croatia! 2 Lovely covers from Malaysia! 2 Awesome covers from Europe! My first cover from Ethiopia!